The weather was gorgeous on that June morning in 2005, and the surf was calm. I stood on the South Brazos Santiago Jetty at the juncture where water meets the beach and was having a good day fooling hefty speckled trout with a Pop-R. A fellow angler walked up as I was stringing my fourth trout of the morning. He was a fellow angler, but different. He carried a 12 foot long Ugly Stick/Penn 9500 SS combo, a gaff, and a mesh grocery bag. On the end of what appeared to be 20 pound test, he had tied a long black leader and a palm-sized blue/chrome Rat-L-Trap. “You’re loaded for bear,” I commented as I looked over his outfit. “I’m going down to the end o the rocks to see if I can scare up a kingfish or two,” he said. “They come in when the weather is calm like this. After mutual wishes of luck and success, the man went on down the jetties, and I returned to my casting. Thirty minutes later, that same fisherman was walking back to the beach, his reel empty. “On my first cast, I hooked into something I couldn’t turn,” she said sheepishly. It took the thing 45 seconds to completely spool me. 350 yards of line, gone. That’s what can happen beyond the breakers: you could get your head handed to you in the first round. 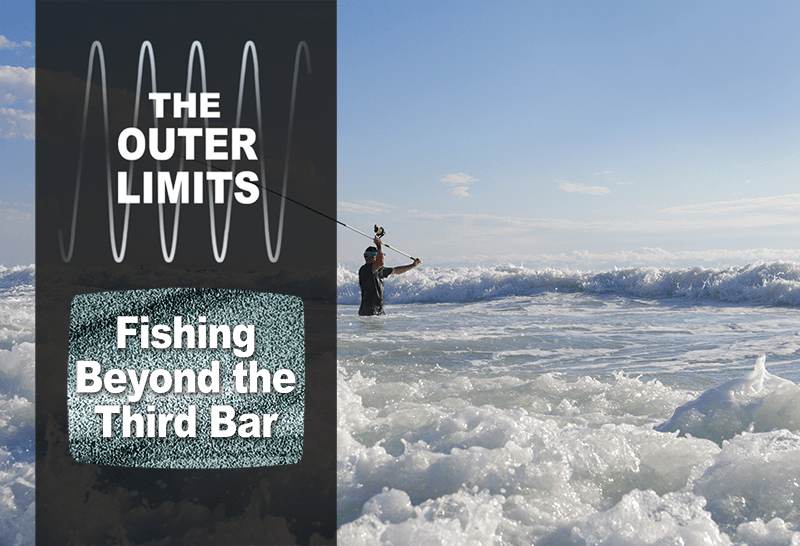 Most Texas surf anglers are content with fishing the first and second guts of a beach. Why not? You’ll find good numbers of game fish such as speckled trout, redfish, flounder, Spanish mackerel, and snook lurking in the sudsy water roiled by waves breaking over the sandbars. Still, a few anglers look past the waves towards the calm seas reaching towards the horizon and wonder what swims out there. The popular website Texas Kayak Fishers (texaskayakfishers.com) has dedicated an entire message board, titled “Beyond the Breakers,” to the practice of fishing where few lines have gone before. The bottom is relatively featureless past the third bar, added Lingo, but the depth drops off into deeper water rather quickly from 10 to about 30 feet and schools of baitfish run this edge up and down the shoreline, and thus so do larger predators. The trick is trying to get to the water beyond the surf line. One option is to try and reach out to the Great Unknown with a long cast. Anglers who’ve fished Padre Island National Seashore have been using long surf rods and high-capacity spinning and conventional reels to hurl baits outwards up to 100, 150, even 200 yards from the beach. Penn’s venerable 209 and Spinfisher series of reels or Newell conventional reels were mainstays among long distance casters. Surf rods often stretched 12 feet or more to generate the parabolic action to launch baits out and away. The problem was that the big reels (which were necessary for their line capacity and torque)had low gear ratios, which made reeling in baits a real chore, and the tackle could be too unwieldy to do anything but sit in a rod holder until the bite. Lures were out of the question. Modern technology and materials have mitigated these issues. Reels are more efficient and more compact, but still retain the line capacity of their predecessors, and rods are also made of lighter materials which make them easier to handle. My outfit of choice is a Shimano Tranx HG fitted onto a 9’ Tiralejo surf rod. The Tranx sports a line capacity of 475 yards of 40 pound braid, a speedy 6.6:1 gear ratio and 25 pounds of drag. Fitted on the nimble Tiralejo, I can throw a 1 ounce Kastmaster or swim bait 80 to 100 yards and still have enough line on the spool to deal with just about anything that swims. Spinning reels such as the Penn Conquer or Spinfisher share similar qualities: high line capacity, fatter gear ratios, and make casting and retrieving much easier and more comfortable than past versions. With some practice, any angler can become a long distance caster. Anglers who prefer something larger than your typical bull red or brute thug jackfish such as the variety of sharks that roam the drop-off use baits and gear that are often impractical to cast. In that case, a different approach is adopted. When Alvarado and Cuellar are shark fishing, it is far easier to transport the bait through paddle power. Cuellar sculls through the waves in her 12’ Ocean Frenzy kayak and paddles out 300 yards and drops the bait (usually a horse mullet, or a fresh stingray if they can get one). Then she paddles back to shore and both watch Netflix until the clicker starts to buzz. The type of kayak Sarah uses should be noted. The Ocean Frenzy is designed specifically for use in the surf and open sea. It is more stable and handles the waves better than a kayak designed for bay and river use. Even then, Cuellar will not venture out into surf that is too rough, and she never goes out without the proper floatation device. Safety should always take precedent for any angler opting to paddle or—as I’ve seen on more than one occasion—swim their bait out past the third bar. After all, you do want to return from your foray to the Outer Limits.